There are some things in life that I have a love/hate relationship with. I was thinking about this the other day when I made a bundt cake, a Pistachio Bundt Cake. It was delicious and moist. Oh yeah, the above pictured was not my cake. I failed to follow some important directions which caused it to look like not so pretty. What I really love about the bundt cake is the multiple ridges – when I’m feeling self-discplined (as if that’s even possible with cake), I only cut a small ridge. When self-discipline flies out the window, I cut a wide ridge or maybe even a small and a large ridge together. Gluttony. 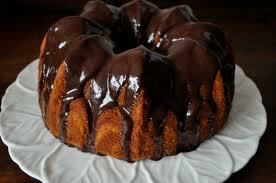 True Story – when I was pregnant, my husband made me a yellow bundt cake and dribbled chocolate icing on it. All because I was craving wedding cake. Bundt cake in lieu of wedding cake is not such a bad thing. And yes, my husband is awesome. But darn it if I don’t hate washing the bundt cake pan. Those darn ridges. They’re just so hard to clean – lots of scrubbing and double checking to make sure they’re really clean. Such a pain. Which reminds me of another love/hate relationship; I love being skinnier, but I hate eating well. And by well, I mean cutting out the box of cookies and 2 Dr. Peppers a day. I love our dogs. I do not like they’re general dog tendencies. Why do they have to be so dog-like? Don’t they mostly pretend to be human by constantly wanting my food, sleeping on my bed or laying on my lap. Yes, the 60+ lb dogs will lay on my lap sometimes. I know, it’s my fault because I let them. But if they want to me more like a human why don’t they clean the mud off their paws before they come inside? Why do they have to track in mud when I just mopped the kitchen floors? Or, how about when they whine to be let outside? Come on dogs. You’re resourceful. You’ve managed to eat 10 peanut butter cookies as they cool on the cookie sheet without knocking the pan over or making a noise, you figure out how to get outside. I love my friends. I hate that I don’t get to see them as often as I would like. Some live in town, some work, some live thousands of miles away. I love them all. I just wish we could all live next door to each other. I love the ocean. I hate sea creatures. I shudder thinking about things hanging out in the water, potentially bumping into me. Or worse, hurting me. I blame an early childhood warnings regarding jellyfish. Jaws and shark week did nothing to help overcome those fears. A friend and I were swimming in the ocean and she innocently mentioned that she saw a fish swim by. It could have been a minnow for all I know, but it freaked me out. Maybe it’s because when it comes to swimming skills I am no match for a minnow. All in all, my love for these things is not overshadowed by the dislike – I will NOT stop eating bundt cakes, loving my dogs, planning beach vacations, or loving my friends. What about you? Any love/hate relationships.